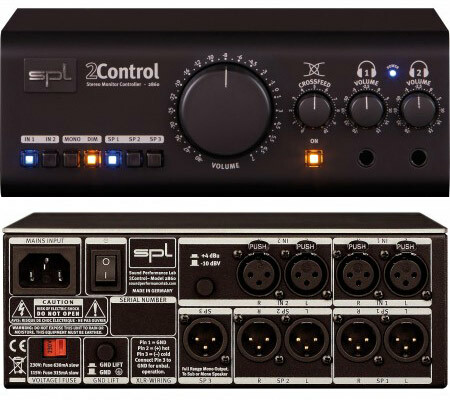 SPL 2Control - combines speaker and headphone monitoring control with innovative features in an attractive high-quality package. The all-analog 2Control allows for connection and selection of two stereo input sources, two stereo speaker sets and two headphones. A third mono speaker output can feed a subwoofer. Speaker volume is controlled by the central, massive volume potentiometer. Each headphone output is fed by its own amplifier stage and can be controlled independently. Mono and DIM switches provide further necessary monitoring functions. But the key function is undoubtedly the crossfeed control, a new innovation from SPL. It simulates frequency-dependent interaural level differences from both channels so that the super stereo effect on headphones can be adjusted to the stereo width of a given speaker set, which essentially means that the user is able to adjust the crossfeed with the headphones to match the stereo imaging of the speakers in the room. This is a new and unique feature which allows audio to be mixed on headphones. The 2 Control addresses all DAW users in audio mixing and AV production with the need for monitoring control and is especially effective in avoiding acoustically problematic environments (desktop workspaces, recording mobiles etc. ).